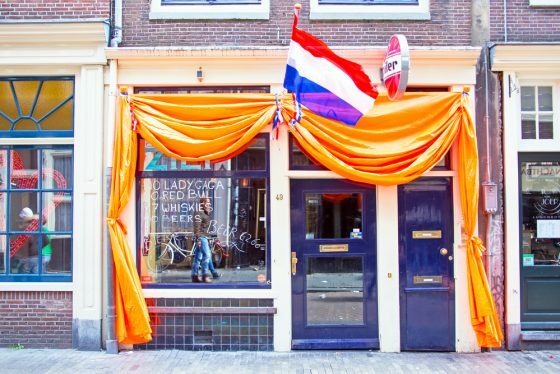 What is a taalcafé and can it really help improve your Dutch? Learning Dutch can be a tricky thing, so teachers are always coming up with new ways to help learners absorb the language. So what is a taalcafé and can it really help improve your Dutch? Deborah Nicholls-Lee tests it out. I have just had a French conversation with a Dutchman about Russian literature, discussed the shortage of student accommodation in Dutch with a Turk, and learnt – thanks to an English-speaking German PhD student – about Economics’ inability to provide concrete answers. I was nervous as hell beforehand, but the language café experience is proving fascinating. Tonight is party night where language learners are invited to come together in one big melting pot. It’s a polyglot’s paradise, but can it help me learn Dutch? According to Koen Gyzel, from Amsterdam Dutch language school Koentact, it can. He opened the school’s first language café to provide ‘a more free-style playground’ for students who had completed his courses to keep up with their Dutch and stay in touch. Three quid in, beer in hand, and determined to overcome my shyness, I have found – to my surprise -that he’s right. Everyone is really friendly and keen to help me with my Dutch. The stickers – with our names on, the languages we speak, and the ones we want to practise – act as the perfect ice-breaker. I adopt a tactic of bee-lining anyone looking lost, on the assumption that two lonely people make one grateful conversation – and it works. People are brushing up their languages for a range of reasons. I meet Ahmet, a doctor from Turkey, who needs Dutch for his work; Stephan from Germany, who is in a long-distance relationship with a Brazilian girl and wants to improve his Portuguese; and Ruben, from Utrecht, whose list of languages is extensive, and who tells me with a grin: ‘It’s my hobby’. Back at the language café, the salsa class on the mezzanine is in full swing. It’s a big hit with the party-goers but feels like a hip-thrusting step too far for me at this point. Besides, I am having too much fun downstairs to focus on choreography. I go home much later than anticipated, slightly tiddly, and excited by this underground language scene that I have uncovered. Emboldened by the success of the evening, I sign up for a language exchange at Pages Bookstore the following afternoon. In contrast to the sweaty dancing and lively bar at the Salsa party, Pages – an Arabic bookstore in Amsterdam’s canal district – is a small-scale homely affair that feels rather like school crossed with afternoon tea. A small group are gathered around a dining table, cradling hot drinks in floral mugs, while our group leader, Ghiath from Damascus, directs the conversation in a mixture of Dutch and Arabic. He is also learning Dutch and it is encouraging to all be in the same boat. Among the group are Dutch Arabists, Tunisians, Syrians, and me – a Brit. Though I know just a few words in Arabic, I am made to feel very welcome and enjoy the opportunity to practise my Dutch and help others with the basics. Some of the group are teenage refugees who have been in the country just a few months but are already making great progress in the language. The liberal use of translation creates a nice safety net for beginners and the atmosphere is warm and relaxed. I go home feeling that I have not only stretched my Dutch language muscles, I have learned about other cultures and met some lovely people. Four days later, I go slightly off-brief and attend a French language café in the Jordaan. This time the structure is more like speed-dating meets quiz night. We are grouped around tables and are tasked with making introductions, solving riddles and singing along to Les Champs Ėlysées as the group leader strums on his guitar. There’s a bar again – that’s good – and I am still there when they are taking down the flags and stacking the tables. There are familiar faces from the Salsa night and some exchanging of numbers. Focused on the language-learning aspect of the cafés, I had overlooked the important social benefits. ‘Language cafés are a great way of meeting other expats as well as friendly locals,’ says British expat Ben Compson, who has lived in the Netherlands for four years and is taking Dutch lessons with the ROC in Amsterdam. Though he acknowledges the ‘initial awkwardness’ of speaking in another language, he has found that struggling over a language together can be a great ice-breaker. ‘You tend to make mistakes and laugh together, as well as finding things out about the other person,’ he says. ‘I have five friends who have relationships through the Amsterdam language café,’ he laughs. ‘I’m 100% sure that there will be some marriages coming up.’ I knew it. The matchmaker in me loves the concept even more. I’ve signed up to the Dutch one next week – and I’m bringing some single friends. ‘Deborah attended the French language café and salsa night with Amsterdam Language Café and the Dutch-Arabic language exchange at Pages Bookstore Café. To find a taalcafé near you, check out Meetup or Facebook. Many libraries also run language exchanges. Here are a few that we know of. Most are either free or charge a small fee. Feel free to suggest more in the comments section below.